Football field maintenance is year-round work, as the grounds crew tries to keep the field in shape during the season, and restore all damage during the offseason. At De La Salle High School, the football field sees its fair share of damage, and it requires attention of the grounds team. The area between the hash marks in the middle of the field became extremely worn and needed repair. Sportsfields was called in by Head Groundskeeper Bill Yos. With a combination of topdressing, aeration, and overseeding, the issue was solved and the playable field restored. Sportsfields crew members Clayton Alexander and Joe Miller began with a complete aeration of the existing turf. This allows water, air and fertilizer to reach the roots of the grass. Topdressing is the next step. Biosolids are a byproduct of wastewater treatment. The standard wastewater removal process that is used in the City helps produce this material that is heavily fortified in nutrients and other helpful minerals. These minerals and nutrients are perfect for grass, allowing it to grow healthy and provide all the necessary health benefits the grass probably isn’t receiving without it. 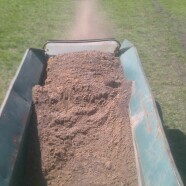 The dressing is a mixture of biosolids and coarse sand which helps the organic matter work in and reach the roots. Biosolids, when used in conjunction with the football field maintenance at De Lasalle, also improves drainage, softens the turf, which reduces injuries during the season and increases the resistance of the grass to pests and disease, as it is harder for these to reach the root system and spread throughout the grass. The use of the topdressing in the playing surface has significantly improved the overall appearance of the field. With extensive use, the bald patching throughout the field should be a thing of the past, allowing the field to look more appealing and improve the overall safety. Dirt surfaces do not give much traction for cleats, which in turn may result in injuries, especially when it rains and it turns to mud.